Outdoor activities, games, creative recipes, craft ideas, a new rhyme and so much more to introduce children to the joys of skating. Posters, decorations, activity sheets, word flashcards, coloring pages, crafts, and several other documents that will help you glide through winter. (Open thematic poster-At the rink) Print, laminate, and display all kinds of posters. 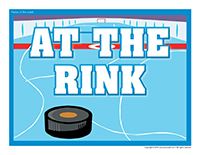 (Open educa-decorate-At the rink) Print, cut out, and laminate. Use the items to decorate the walls of your daycare and set the mood for the theme. Decorate your daycare with snowflakes of all sizes and shapes. You can stick some on your walls, hang others from the ceiling, and display some in your windows. Set large pieces of white paper or fabric on the floor to represent ice. 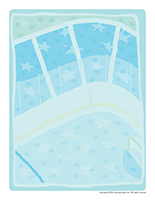 Hang large pieces of paper along the bottom of your walls to represent ice rink boards. With your group, draw people on paper and display them above the boards. They will be spectators for your numerous activities. This special tool was created in response to a special request received. (Open Poni clock) Print and laminate. 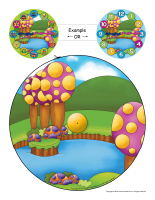 Display the Poni pictures around the contour of your clock to help children associate each hour to a different picture. What they like to do most at the ice rink. If their parents know how to skate or if they play hockey. If they have ever been to an arena and if so, why. What can be seen at the ice rink. If it is hot or cold in an arena and why. To name their favorite hockey team. 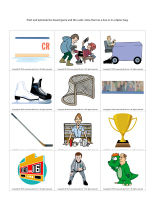 (Open picture game-At the rink) Use the pictures to decorate your daycare or to spark a conversation with your group. Print, laminate, and store the pictures in a Ziploc bag or in your thematic bin. 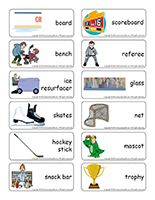 (Open writing activities-R like rink) Print for each child or laminate for use with a dry-erase marker. (Open educa-nuudles-At the rink) Print for each child. Have children color the sheet. Once they are done, they may use Magic Nuudles to turn the coloring pages into three dimensional works of art. Variation: If you do not have Magic Nuudles, ask children to fill the spaces designed for Magic Nuudles with bingo markers or stickers. To order Magic Nuudles. (Open stationery-At the rink) Print. Use the stationery to communicate with parents, in your writing corner, or to identify your thematic bins. 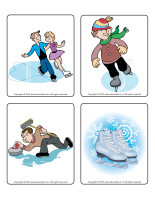 (Open activity sheets-At the rink) Print and follow instructions. (Open observation sheet-Number 6) Print for each child or laminate for use with a dry-erase marker. You will need hockey sticks and one or more pucks to play hockey with your group. If possible, plan a hockey game against another daycare group or plan to meet up with another daycare at your local playground. Invite children to line up on an ice-covered surface (wearing their boots). When you give the signal, they must pretend to skate to the finish line as fast as they can. Organize a trip to your local ice rink and invite parents to join you. You can skate with your group or simply admire the skaters. Have children stand in a circle and hold hands. Slide a hula hoop between two children before completely closing the circle. The goal of the game is for the hula hoop to make it all the way around the circle without the children letting go. Will your group find a way? Spin a hula hoop in the centre of your playing area. Children take turns touching it to keep it spinning for as long as possible. Set a variety of low objects on the ground. Children must jump over them like acrobats. If you wish, you may also use hula hoops. Invite children to sit cross-legged on their towel, with their back very straight. Have them place their feet on top of their knees and swing back and forth very gently. (Open acrobatic figures) Print, laminate, and display the acrobatic figures on a wall. Invite children to work with a partner to combine the figures to prepare a short show that will be presented to the sound of music. Set one hula hoop on the floor for each child (or use electrical tape to draw circles on the floor). Each circle must be big enough for a child to move around inside it. Give them directions. For example, you can ask them to touch the floor with their hands, to place one foot outside of their goal, to sit down inside their goal, etc. From time to time, when you want children to trade places, say, "Change goals." Create an obstacle course and give each child two empty tissue boxes they can wear on their feet to "skate" from the start line to the finish line, avoiding the various obstacles that make up your course. Variation: If you prefer, divide your group into teams and create two identical courses, side by side. The first child from each team completes the course and then skates back to tap the hand of the next child in line. The first team to see all of its players complete the course wins. 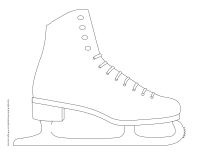 (Open game-figure skating elements) Pick a picture that represents a figure skating element. Play music and have children take turns performing the element. Variation: Children skate around the daycare. When the music stops, everyone falls to the ground. When the music resumes, children start skating around again. (Open lacing-skates) Print, laminate, and punch holes all the way around the models. Children can thread a string, a shoelace, or ribbon through the holes. 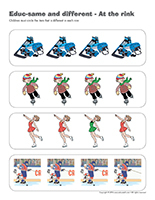 (Open educ-same and different-At the rink) Print and laminate for durable, eco-friendly use. Children must circle the illustration that is different in each row. (Open educ-math-At the rink) Print and laminate for durable, eco-friendly use. Children must count the items in each rectangle and circle the corresponding number. (Open magnifying glass game-At the rink) Print. Laminate the board game and the cards. Cut out the cards and store them in a box or Ziploc bag. Children pick a card and search for the item on the board game using a magnifying glass. Once they have found a match, they deposit the card in the corresponding square, on the board game. (Open educ-pattern-At the rink) Print and laminate. Children must use the cards to complete the patterns. Add a cup of your favorite juice and ice cubes to the jar of your blender. Blend to make homemade slushies. Exceptionally for this theme, serve food items that can normally be purchased at your local ice rink's snack bar: hotdogs, hamburgers, fries, etc. for lunch. Often, a trip to your local ice rink rhymes with treats for little ones. Transform your kitchen area to make it look like a snack bar and encourage children to prepare a variety of treats such as popcorn, cotton candy, sausages, candy apples, etc. (Open creative recipe-Salt dough baking required) Print. 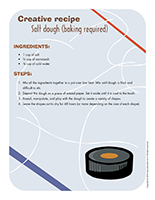 Prepare this salt dough recipe with the children in your group and have fun shaping the dough to represent hockey sticks, pucks, skates, etc. Mix all the ingredients together in a pot over low heat. Mix until dough is thick and difficult to stir. Deposit the dough on a piece of waxed paper. Set it aside until it is cool to the touch. Knead, manipulate, and play with the dough to create a variety of shapes. Leave the shapes out to dry for 48 hours (or more depending on the size of each shape). 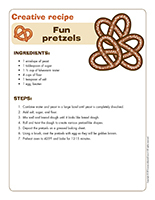 (Open creative recipe-Fun pretzels) Print. Combine water and yeast in a large bowl until yeast is completely dissolved. Add salt, sugar, and flour. Mix well and knead dough until it looks like bread dough. Roll and twist the dough to create various pretzel-like shapes. Deposit the pretzels on a greased baking sheet. Using a brush, coat the pretzels with egg so they will be golden brown. Preheat oven to 425ºF and bake for 12-15 minutes. (Open model-Ice resurfacer) Print for each child. Encourage children to cut out the various parts (or do this step for younger children). Have them wrap a tissue box with aluminum paper before gluing the parts on the box. Let them decorate their ice resurfacer as they wish. (Open models-Skates) Print several copies. Invite children to cut two skates out and decorate them. Hang the pairs of skates from the ceiling in your daycare. You will need a cardboard box. Remove the top and one side of the box so you are left with three walls and a floor. Encourage children to paint the bottom of the box to represent an ice rink, to install boards, to use Popsicle sticks to represent bleachers, etc. (Open model-Black and white medals) Ask children to paint their medal. Laminate the medals and use a hole-punch to make a hole at the top of each one. Thread a ribbon through the hole on each medal so children can wear their medal around their neck. You can have each child perform a figure skating routine and reward them with their medal when they are done. 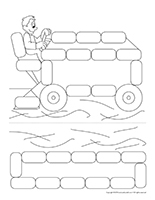 (Open coloring pages theme-At the rink) Print for each child. (Open creative coloring-At the rink) Print for each child. 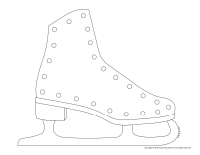 Invite children to complete the picture by drawing people or items on the ice rink. Take out your prettiest dresses and costumes. Divide your group into two teams and invite them to improvise or prepare a short figure skating show. Play music for each choreography. Children will love presenting their show, but they will also enjoy watching their friends' show. 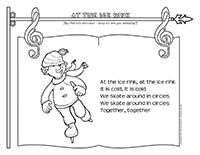 (Open songs & rhymes-At the ice rink) Print. By: Patricia Morrison	Sung to: Are you sleeping?